I am the aam admi that these khas aadmis are talking about. Parties spend crores on their campaigns. Corruption starts right there. People should stop spreading hatred, as that is the source of all ills. These were some of the lines uttered by Lok Sabha candidates for the Bengaluru South Constituency at a debate on 14th April at Sathya Sai Samskruthi Sadan, behind Forum, Koramangala on Hosur Road. Candidates on the stage included Krishna Byregowda (INC), Prof K E Radhakrishna (JD(S)), Dr H G Jayalakshmi (SUCI), Capt G R Gopinath (Independent), K C Janardhan (Independent), Santosh Min (Independent) and H N Ananth Kumar (BJP). SmartVote, a group of Bengaluru-based citizens working on providing candidate information to Bengaluru’s voters and News9, the television news channel, organised the debate, Bombaat Verdict. Proceedings kicked off with candidates introducing themselves and speaking about their vision for the city. BJP’s Ananth Kumar stressed the need to have politics with camaraderie and sportsmanship. He appealed to voters to select the BJP, for they stand for national security, economic progress and ongoing development. He also promised a clean, green and living-friendly (sic) Bangalore. Krishna Byregowda pointed out how the Congress-led UPA has provided a stable pro-poor government in the last four years, and has come up with programmes like JNNURM, NREGA, Rural Health Mission, Energy Mission and so on. He promised to encourage public participation if elected. Santosh Min, a former Claims analyst pointed out that he is the “aam admi that these khas aadmis are talking about”. He said he stands for harmonious living and national integration. Prof. Radhakrishna, an educationist, said he stands for politics of amity and inclusion. He charged the national parties of becoming irrelevant and sectarian. He believes in the unity of diverse cultures, national outlook fused with regional aspirations. He pointed out the need for all pockets of Bangalore, including villages like Puttenahalli to be developed. K C Janardhan, a calligraphist and consultant, said we all face obstructions in our daily life. He promised to voice the citizens’ opinion and represent them in parliament to see the change we require. The experienced politicians looked more relaxed and confident than the first timers. Though all of them were open to engaging with the audience, they rarely responded with specifics, preferring to stick with rhetoric. The compere then moved onto asking specific questions to the candidates, to be followed by questions from the audience. On the question of communalism, on what the candidates would do to ensure communal harmony, the politicians mouthed the usual platitudes. Ananth Kumar mentioned the Vajpayee mantra, Hindu Muslim Bhai Bhai, Bharat mata hamara maa hai. Byregowda talked about one India and said people should stop spreading hatred, as that is the source of all ills. Santhosh Min plans an amendment to redefine secularism; at the local level, he will encourage people-people interaction and felt that religion should be private. Prof Radhakrishna alleged the national parties have destroyed social fabric. Next, the candidates were asked what they would do to alleviate the financial crisis. Santosh Min said FDI and globalisation is not the answer. “HR (Human Resources) is most important. If we make cities habitable, people (who have emigrated) will come back and set up firms,” he said. He felt we should delink from the global economy. Gopinath said the there should be a right eco-system for jobs to be created – communal harmony and absence of corruption. Gopinath charged all the political parties with failing to do their duty, “All these years, you were in power, you have looted the economy and divided the society.” To this, Prof Radhakrishna pointed out when elections are over, independents are the first to be “bought”. Krishna Byregowda said Congress believes in stable growth, not lured by double digit. He said, “Prices have come down in the past six months. Food prices will come down, given good monsoon.” Ananth Kumar charged the Congress of inheriting a robust economy and frittering it away. Dr Jayalakshmi, from the left wing SUCI, was against freezing wages and layoffs. “Unless people are paid, how can they spend (to improve the economy)?” she questioned. Even as the Congress, BJP and JD(S) candidates left the debate to keep their campaign appointments, the discussion continued with the audience posing their questions to the remaining candidates. Gopinath was asked if he will end up being a lone crusader if he doesn’t align with any national party. He replied that it will send the right signal that it is possible to win without money. On the disparity between urban and rural areas, he felt basic infrastructure was essential. He advocated private transport players in addition to KSRTC. Gopinath explained how he will get inputs from citizens by forming citizen committees including well known citizens like Mohandas Pai and Kiran Mazumdar Shaw. At the end, the compere asked the audience, how many of them were satisfied with the answers. A sizeable number of people raised their hands, pointing to the importance of such debates in election times. A glimpse of an artist’s viewpoint of Hampi’s many splendors at Chitrakala Parishat. 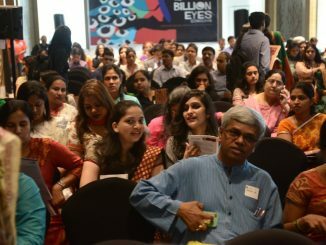 B.PAC’s newly launched A Billion Eyes program calls for organisations to focus on creating safe workplaces for the women of Bengaluru.